If you require signatures and written approval for charging a customer's credit card use the Authorization to Charge Credit Card form. This form is useful for service agreement charges and also for some product purchases (such as large Internet orders). Having a signature will put you in a better position to contest credit card chargebacks and can help reduce credit card fraud. A signed form is also useful to remind customers who may have forgotten they ordered something from you or did not recognized the company name on their credit card statement. This Authorization to Charge Credit Card is included in editable Word format that can be customized in Word or by using the included Wizard software. Company Name authorizes Company Name to charge the following credit card for the specified amount. Enter your credit card details exactly as shown on your credit card and billing statement. Credit Card CVV2 Security Code: (printed on front or back of card). Company Name Attention: Accounting Dept - Fax Fax Number. 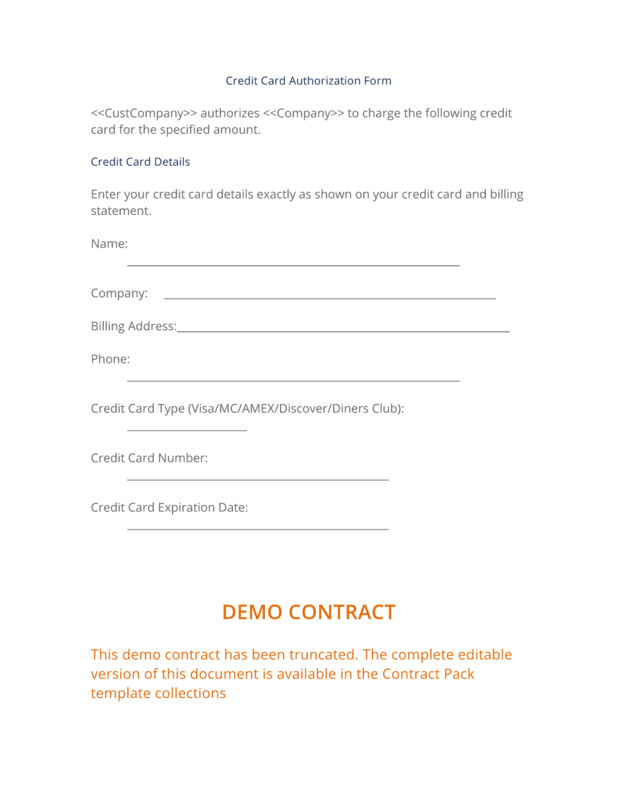 The complete Authorization to Charge Credit Card - with the actual formatting and layout - is available in this Contract Pack.